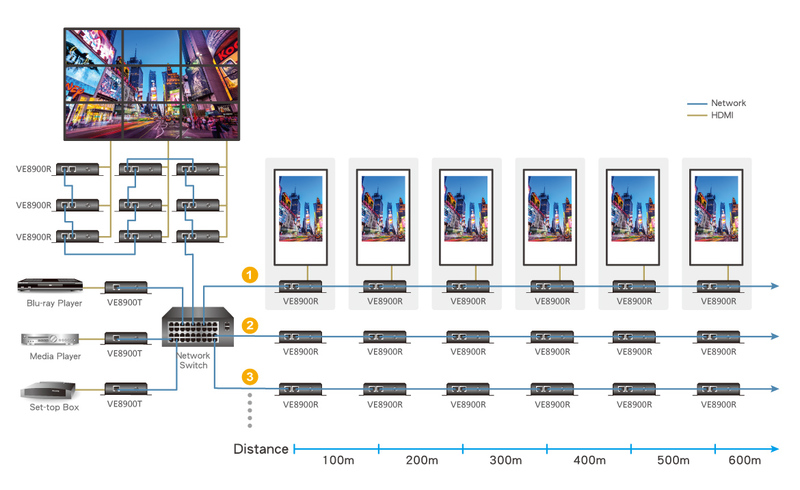 The Aten VE8950 HDMI Over IP 4K extender offers limitless scalability and flexibility from a simple point-to-point to multi-point setup via LAN without distance limitations. The system can be configured to work as an extender, a splitter, a matrix switch or as a video wall (more transmitters / receivers will be needed to split, use as a matrix or as a video wall). Mix and match the latest 4K displays and 1080p screens. The built-in scaler automatically scales up incoming video signal to match the maximum resolution of the connected display devices. The system delivers visually lossless high-quality video up to 4K, ensures stunning quality video using ATEN advanced video lossless compression technology and EDID Expert™ selects the optimum EDID settings for smooth power-up, high-quality display and the best video resolution across different screens. Tags: 1080P, 4K, hdmi, HDMI matrix, HDMI Over IP. The ATEN VE8950 Video over IP Extender delivers visually lossless 4K AV signals with low latency over long distance via a local network of standard Gigabit network switch*. 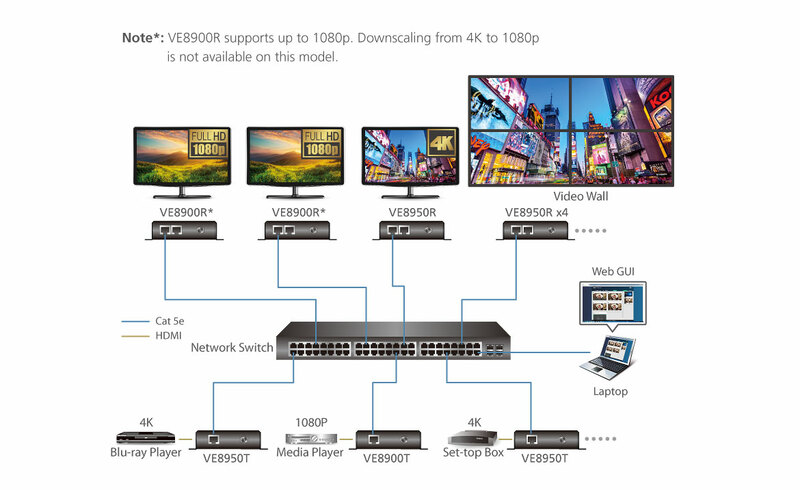 Engineered to meet today’s demands of large scale, multi-display, 4K signal transmission, and designed to be easy to set up and operate, the VE8950 Video over IP Extender is an ideal product for a wide range of environments, such as trade shows, airports, university campuses, conference centers, and shopping centers. Note: Each VE8900T transmitter can be controlled by a total of 4 USB touch screens installed to VE8900T receivers.Please refer to the FAQ link below on how to select network switches and network switch information collected by ATEN Customer Service Division, where the collected information includes customer’s feedback from their actual experience in using and installing the product(s).